Cornell Lab of Ornithology and the Educator Academy in the Amazon Rainforest have been working with local bird guides and Peruvian teachers to bring the BirdSleuth-International curriculum into remote schools along the Amazon River. Lucio Pando, one of several extraordinary guides in the area, enthusiastically shares his knowledge and love of birds with adults and children alike. He admits to watching birds even during his off time at home, he just can’t help himself. Like many of us who are addicted to watching birds, Lucio’s binoculars are a permanent fixture around his neck. While talking with Lucio I learned he does not have adequate access to binoculars and field guides needed for teaching students in local villages. So last spring I was overjoyed when one of my former students donated several pairs of gently used binoculars. 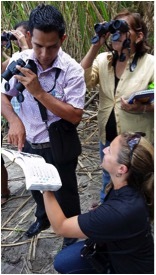 O n July 8, 2015 twenty Peruvian teachers arrived at the Amazon Library in small motorized boats to attend a BirdSleuth workshop presented by Lilly Briggs from Cornell Lab of Ornithology. The Amazon Library is run by CONAPAC, a Peruvian non-profit organization that leads conservation and sustainable development projects in the Amazon. 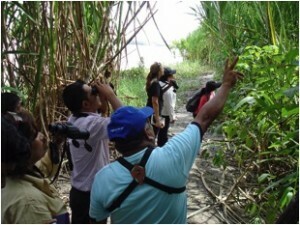 During this workshop Lilly, Lucio and I took these teachers on a short bird walk along the bank of the Amazon River. The teachers were all smiles and filled with excitement as they took turns looking for birds. Having never used binoculars before, they got great looks at some most cooperative birds. As the teachers listened to Lucio share his extensive knowledge they wanted to know how he became such an expert. 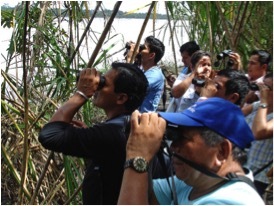 For Lucio it was a deeply meaningful opportunity to inspire fellow countrymen and women to take a closer look at the incredible bird diversity found all around them. After the workshop I handed the binoculars off to a very grateful Lucio, who is now using the binoculars with the teachers and their students. We want to support Lucio and his colleagues in their important work training up the next generation of Peruvian naturalists and bird guides. Your donation of gently used waterproof optics will greatly help Lucio’s efforts. So if you have an extra pair of binoculars please consider saving them for this project. Watch for more information and shipping instructions coming this fall in the BirdsEye newsletter. Teacher participants in the 2017 Educator Academy in the Amazon Rainforest will personally deliver your binocular donation to Lucio and the teachers he works with along the Peruvian Amazon.